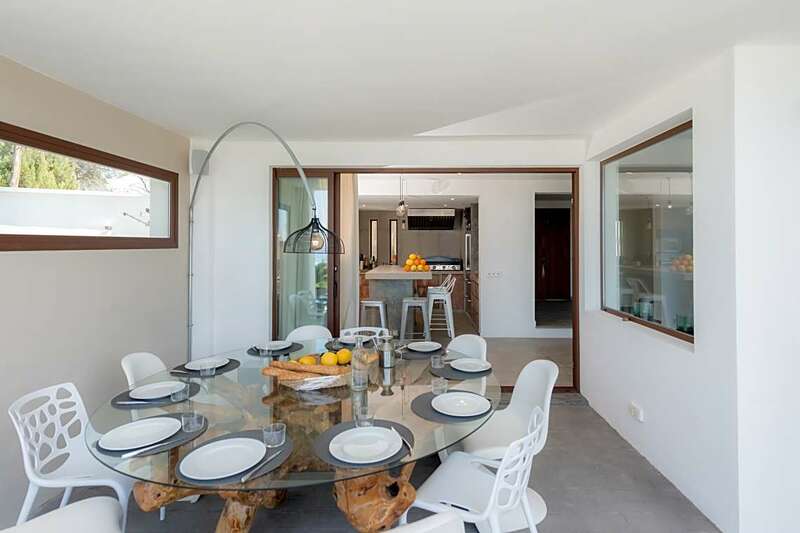 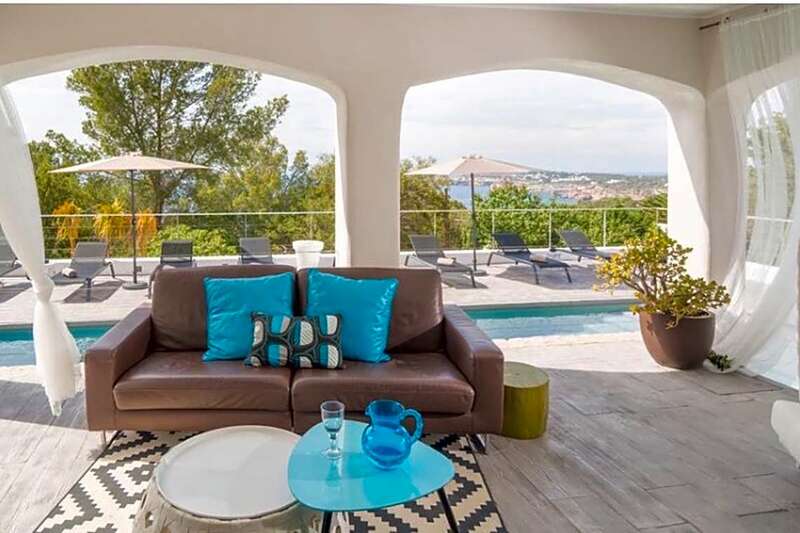 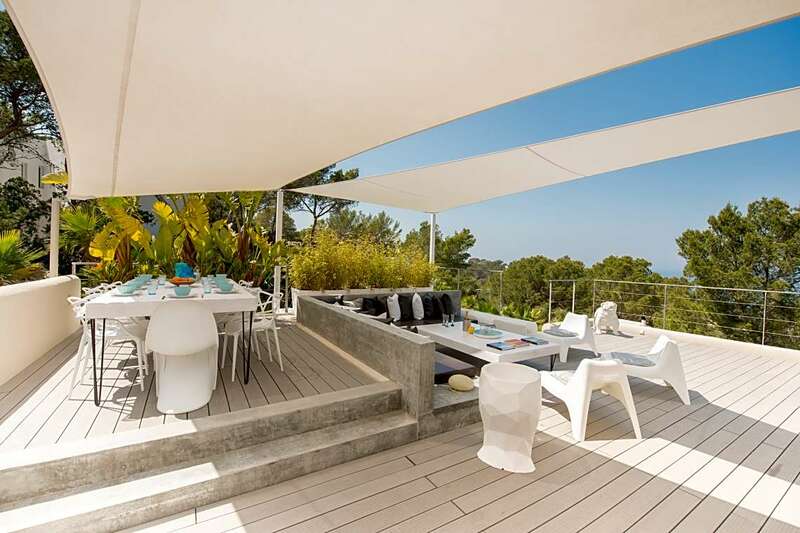 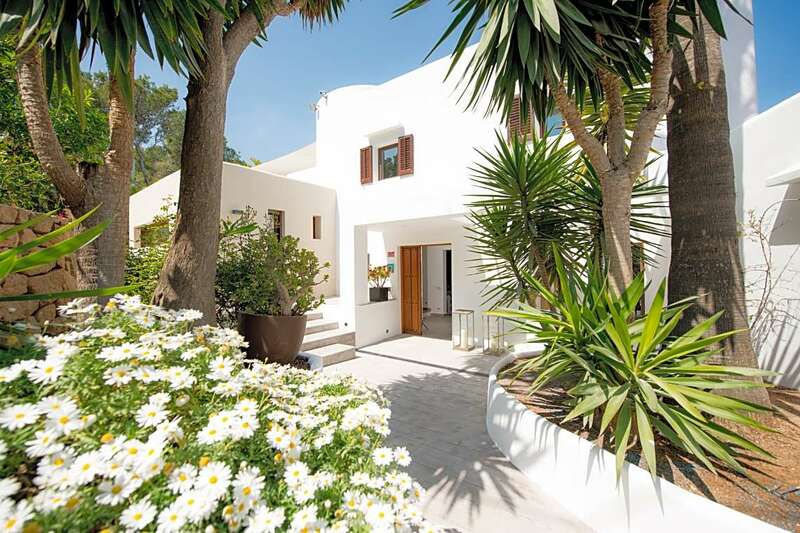 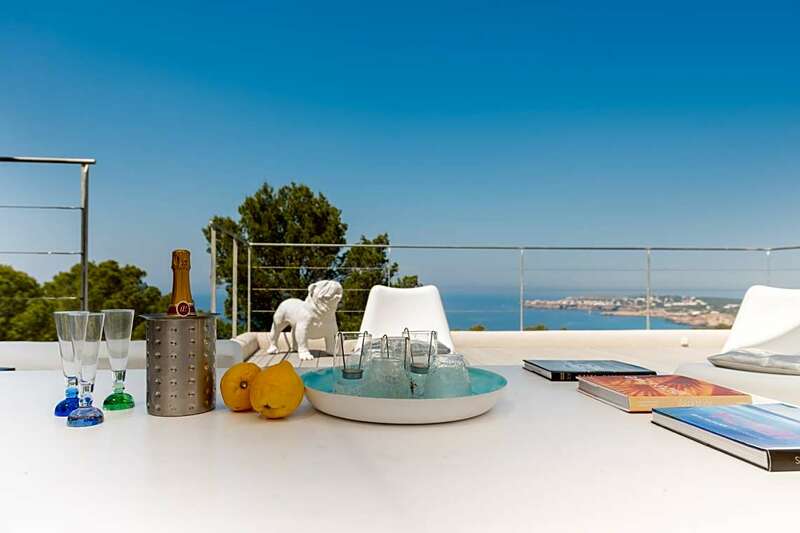 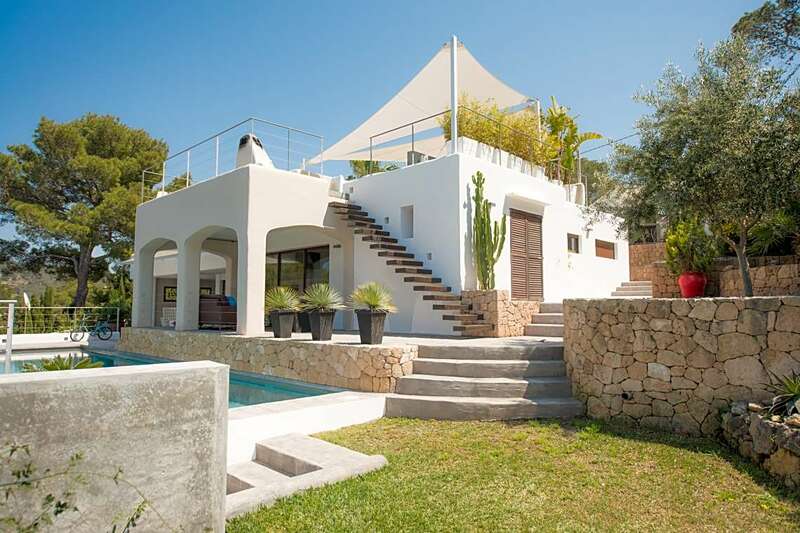 This tastefully decorated Premier Villa is located near the beach of Cala Moli and has a fantastic sea view over the bay. 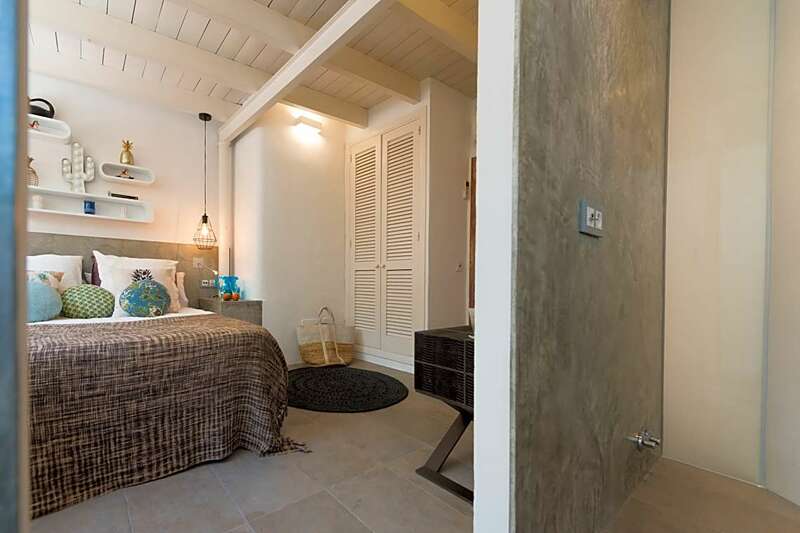 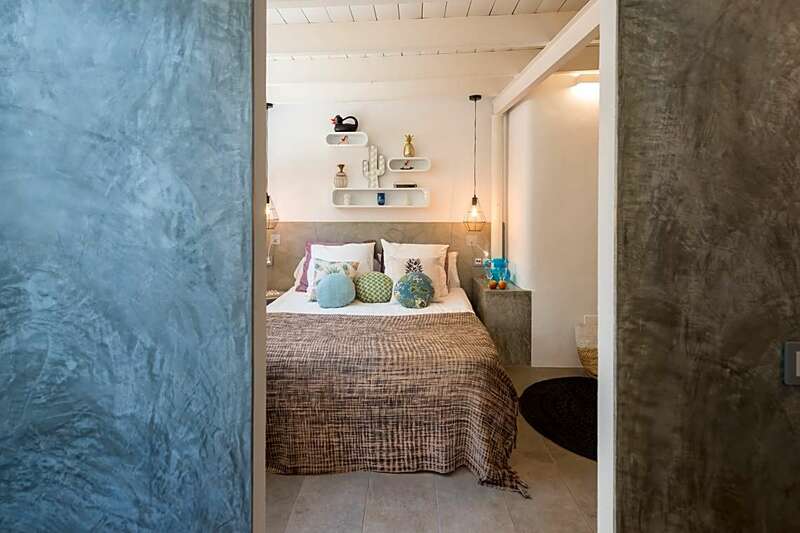 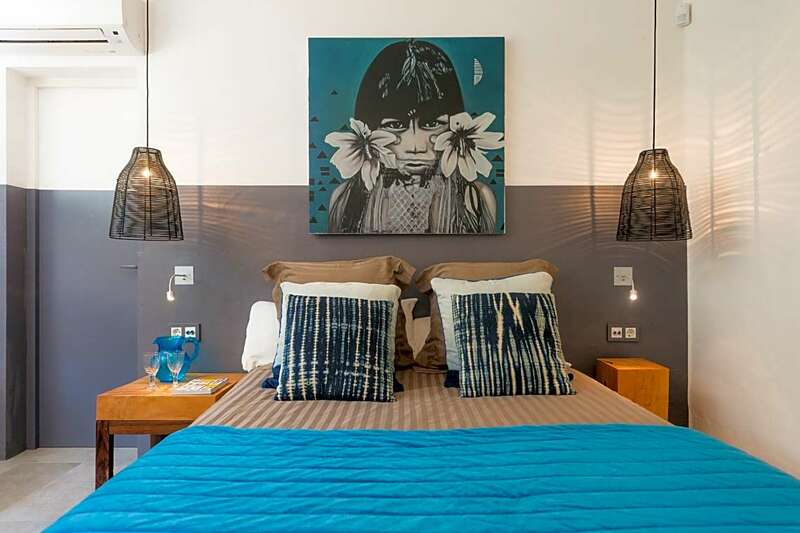 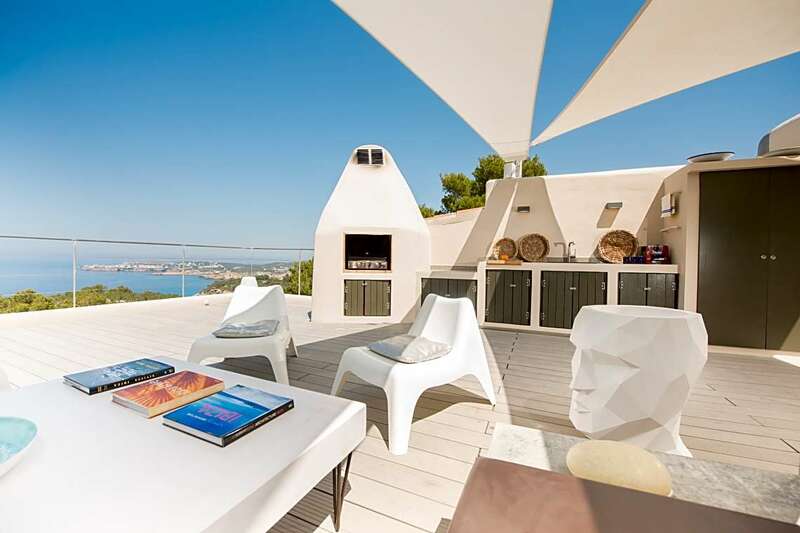 It is the perfect property for families who want to relax and enjoy the calm, tranquility of the island and to fully appreciate the amazing views of the beautiful countryside and the sparkling Mediterranean. 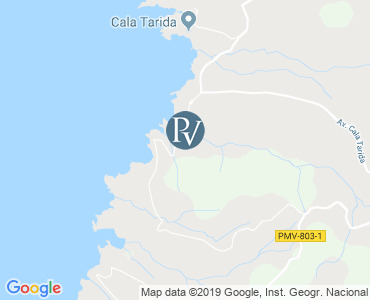 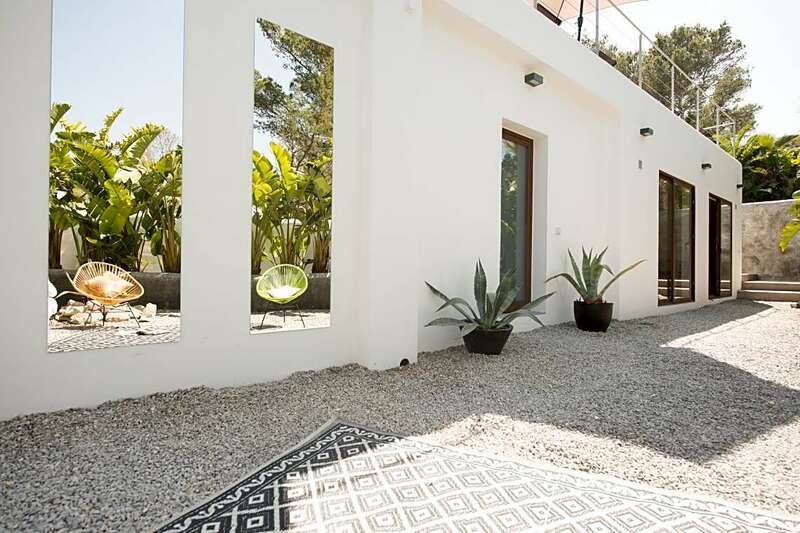 The beach is only a 10 minute (steep) walk away, a 5 minute drive takes you to a supermarket in Cala Vadella, within 10 minutes you can be in San Jose and Ibiza Town is only 20 minutes away. 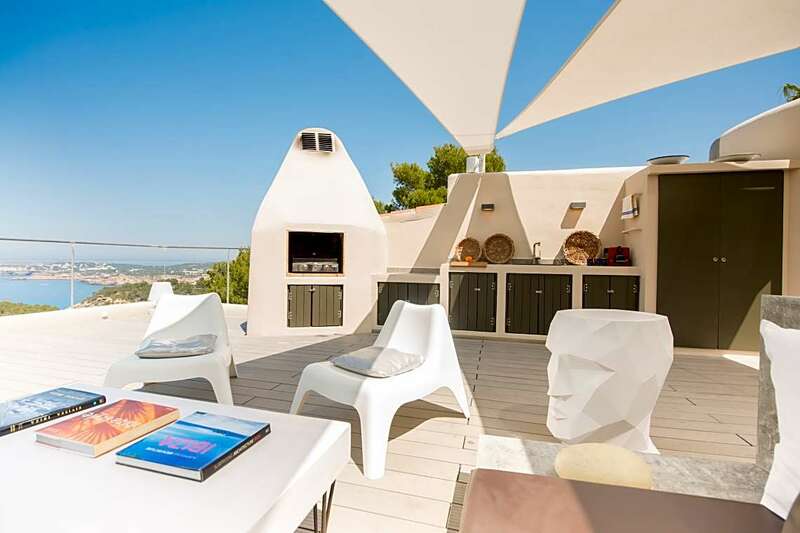 Outside there are several terraces and seating areas for relaxing. 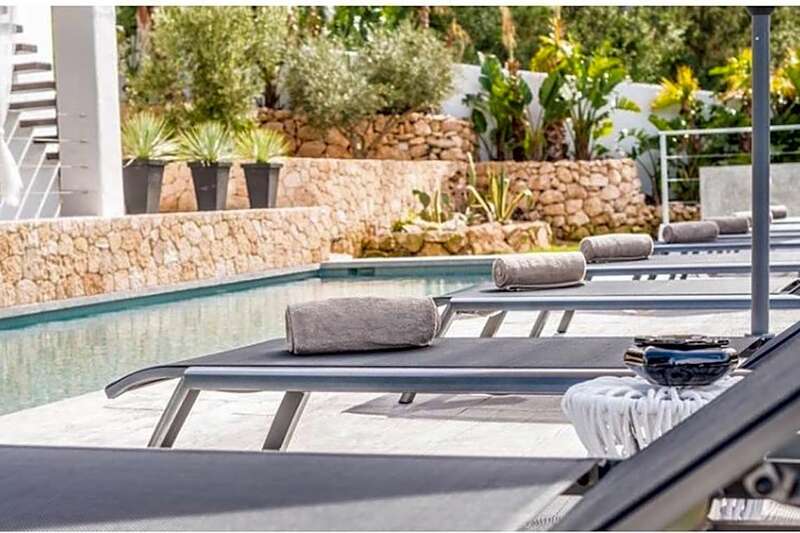 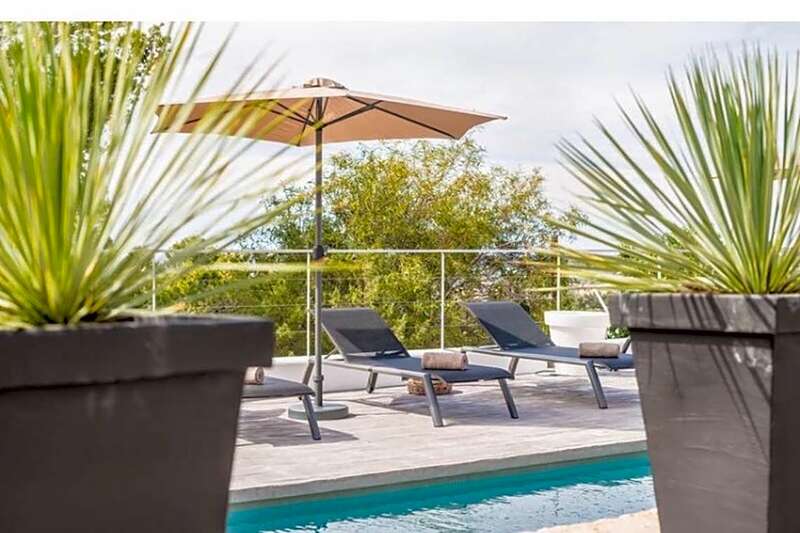 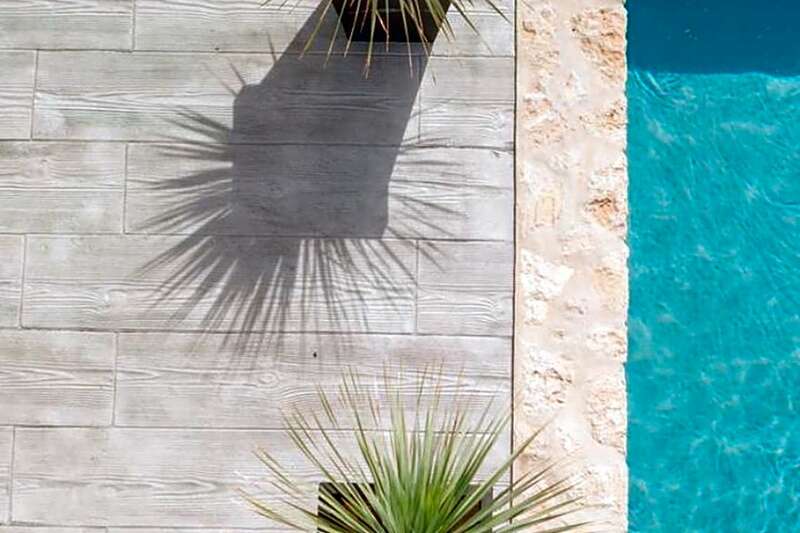 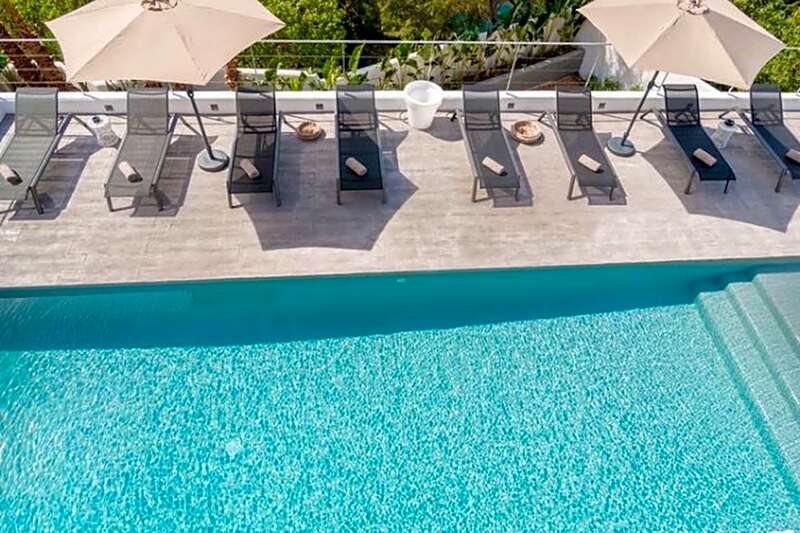 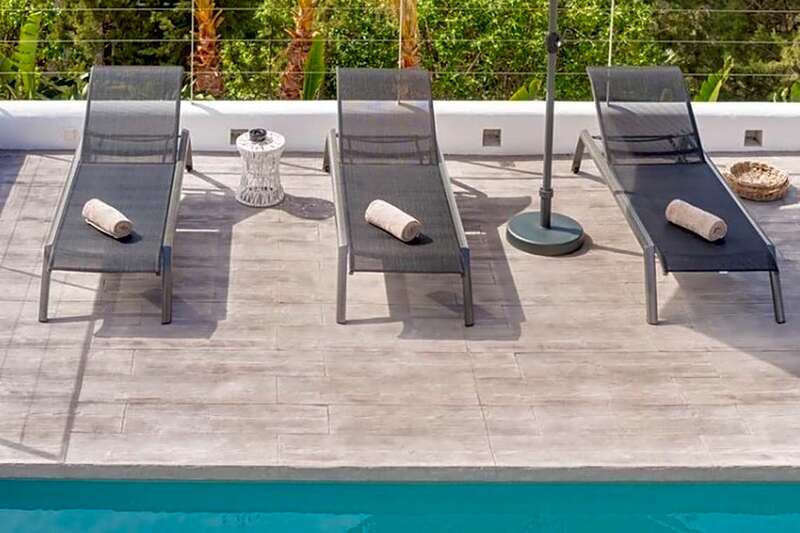 You can sunbathe on the sun loungers surrounding the pool (4m x 15m) or barbecue on the roof terrace and dine Al Fresco while enjoying the fantastic views. 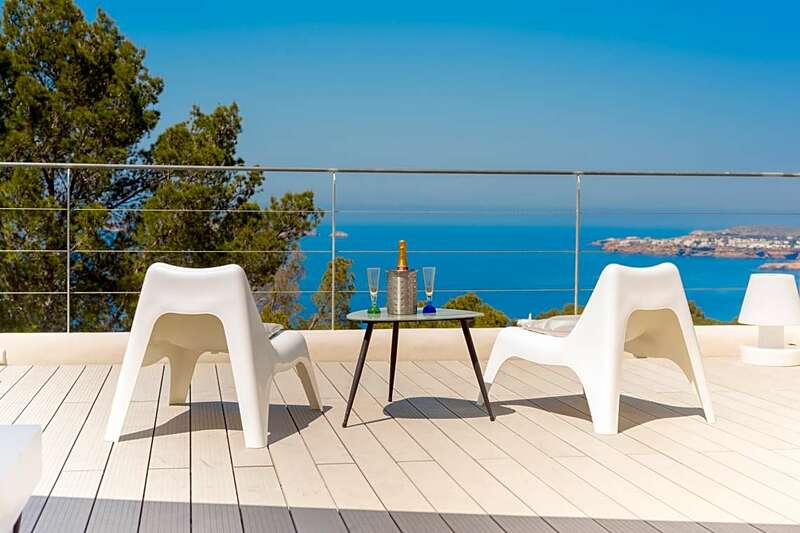 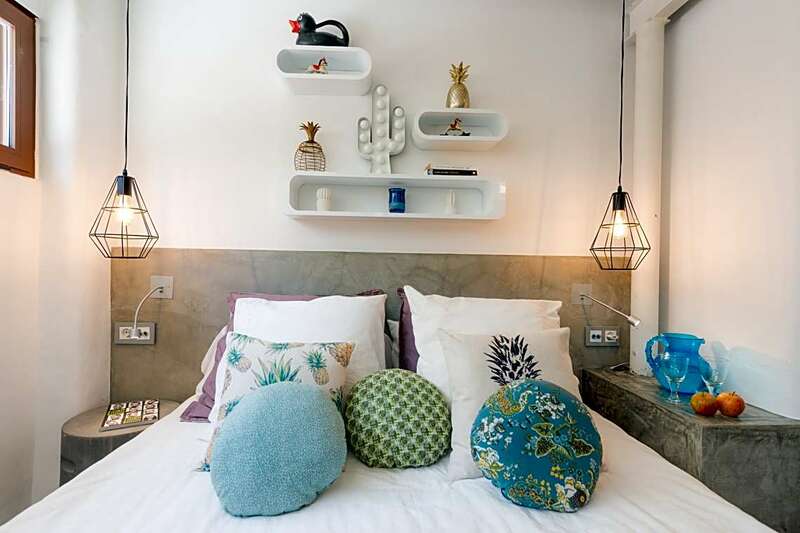 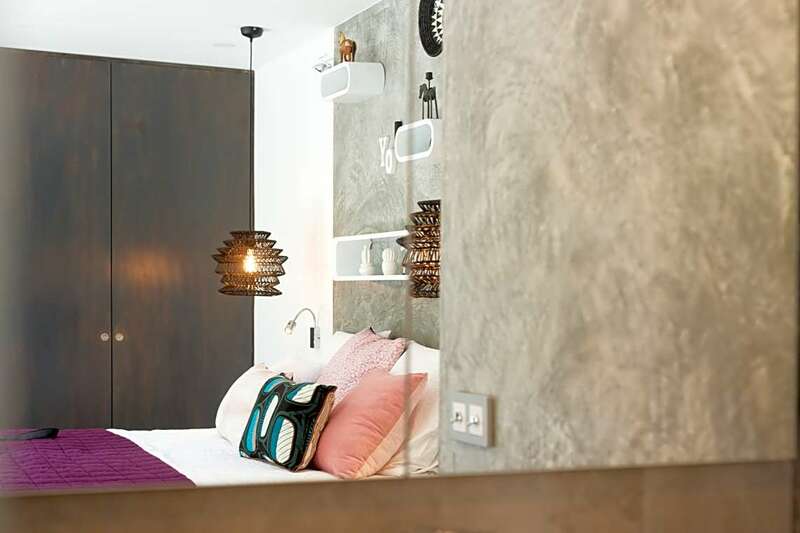 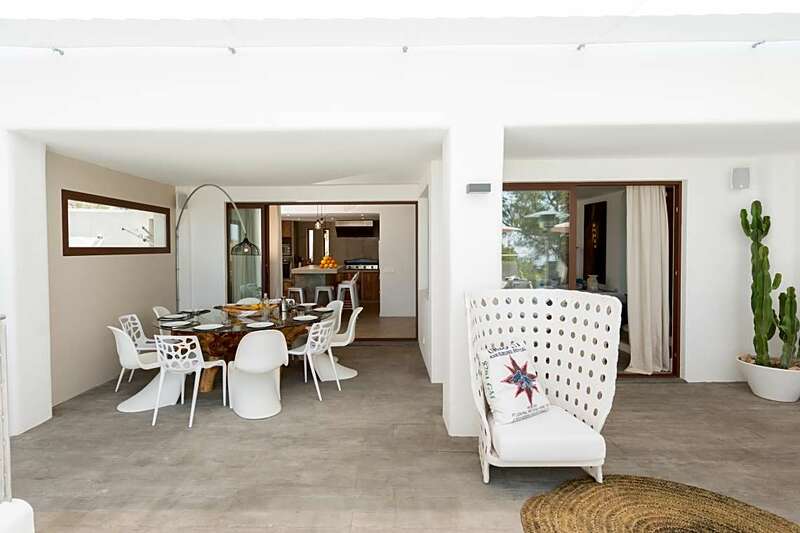 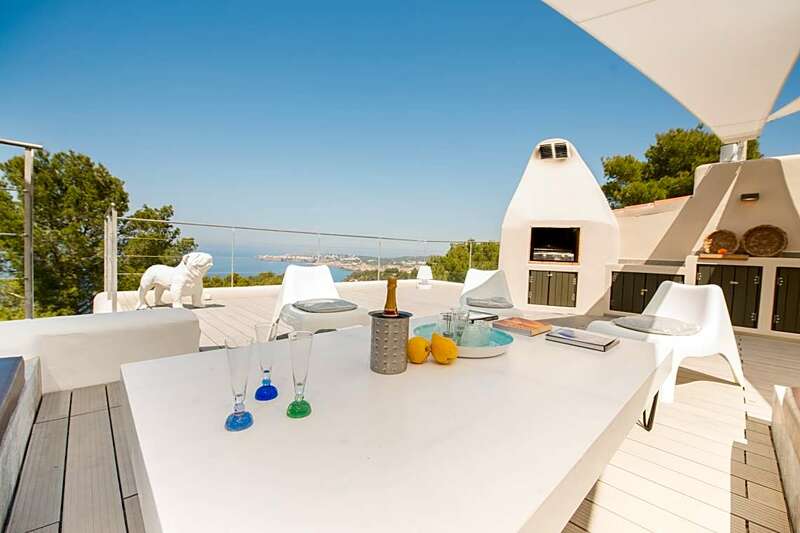 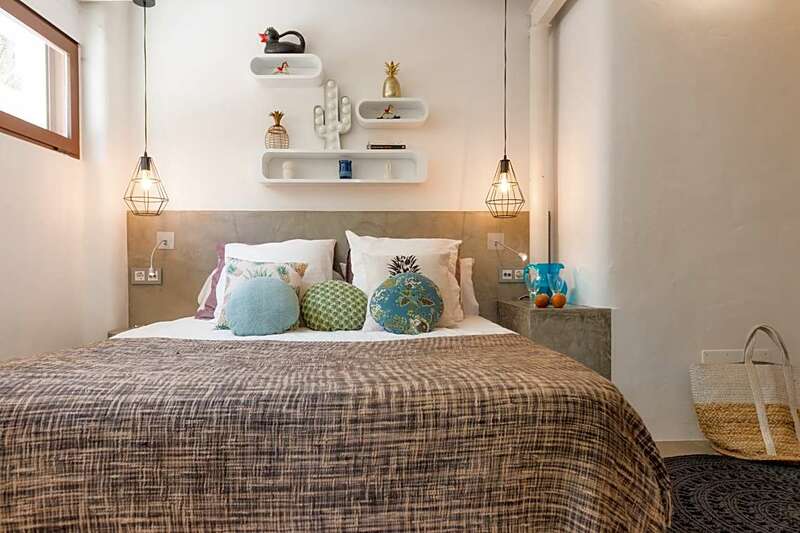 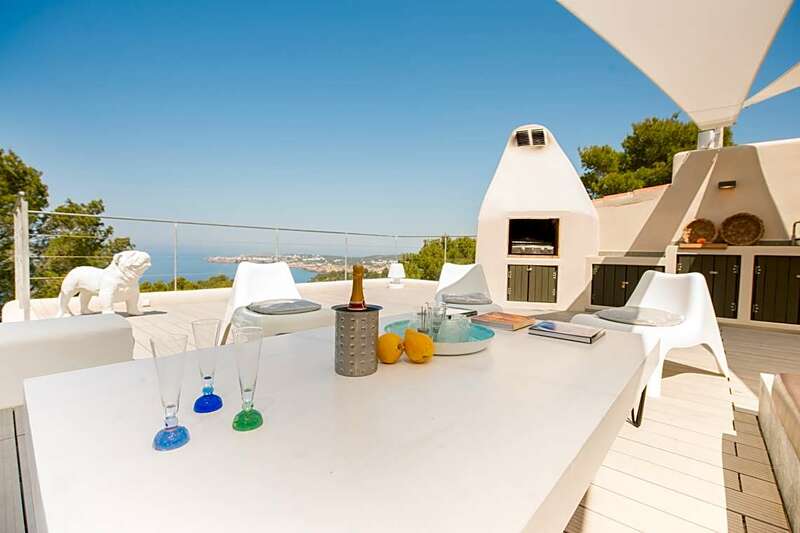 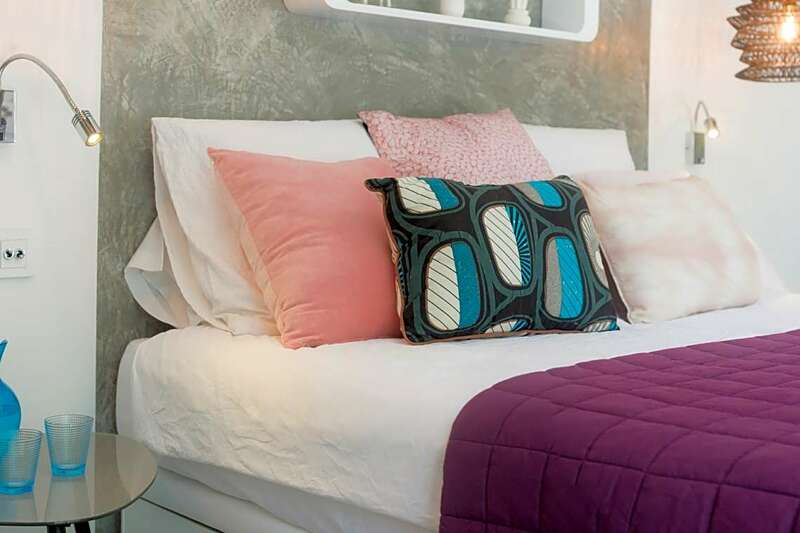 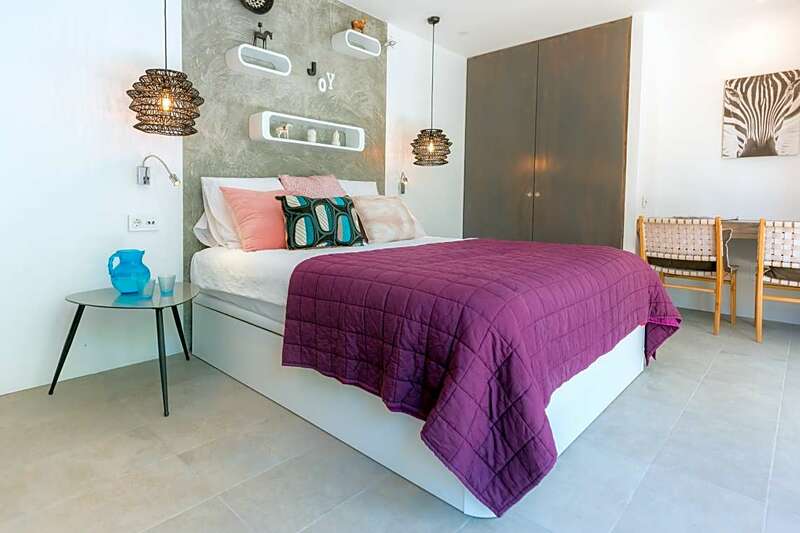 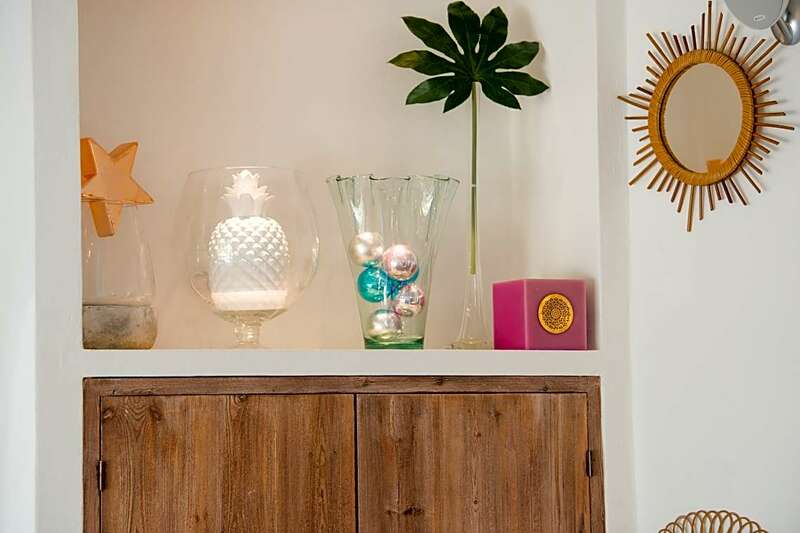 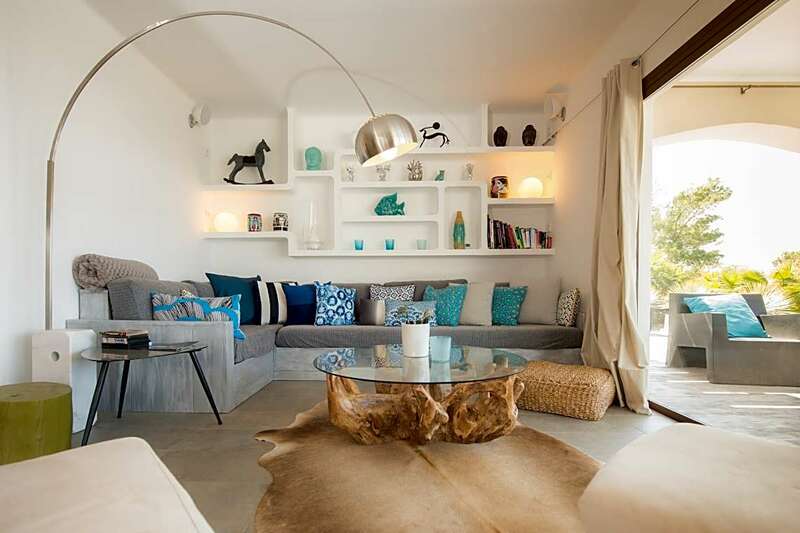 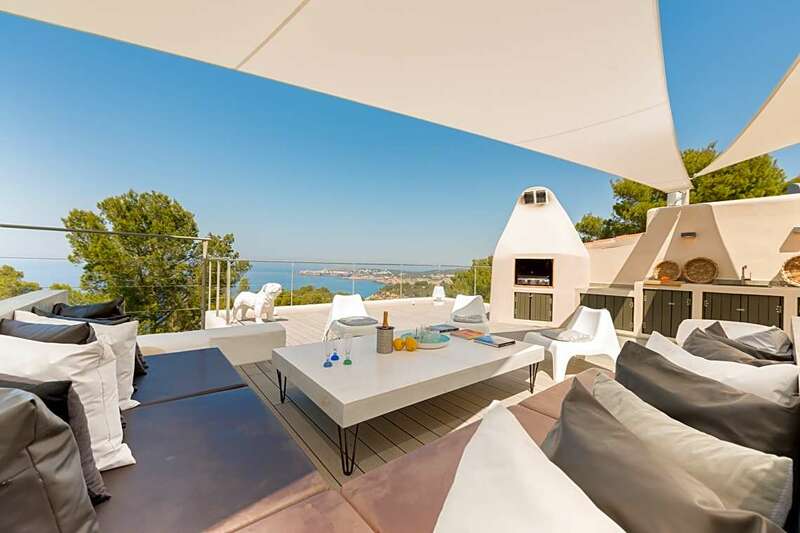 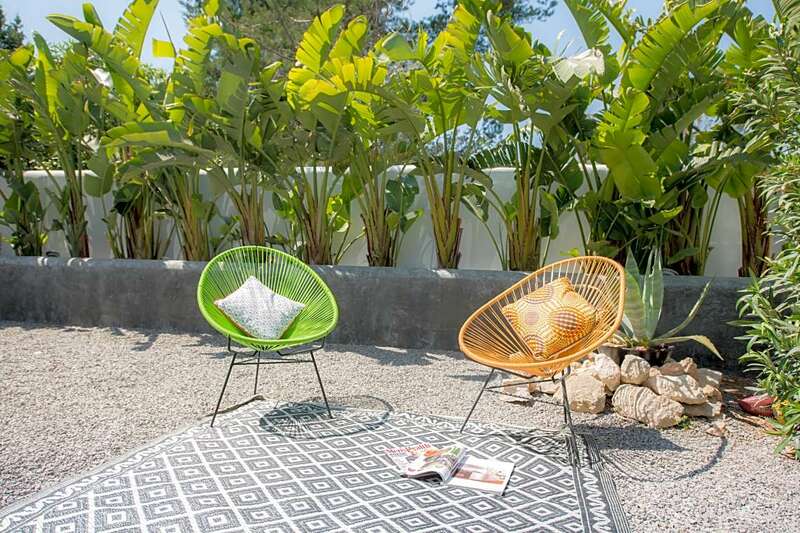 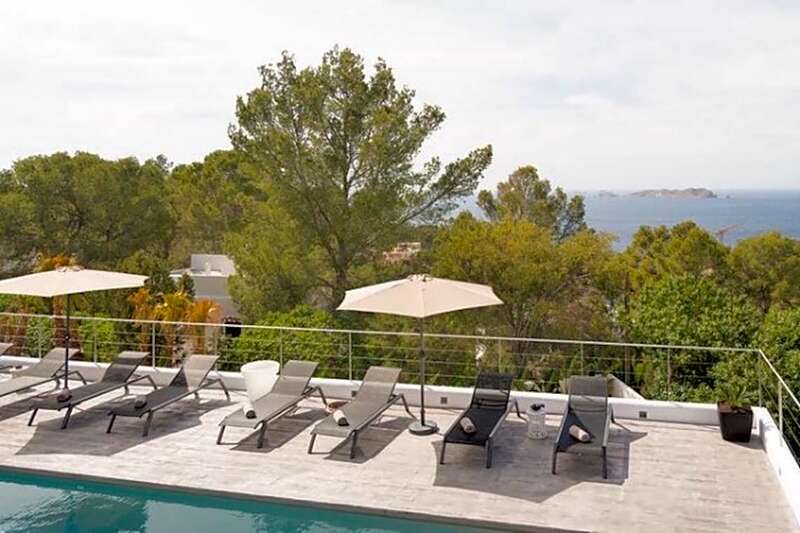 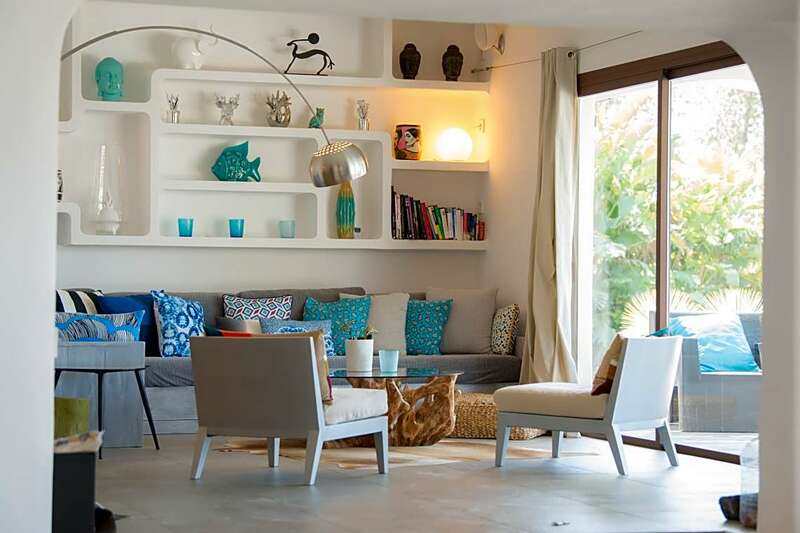 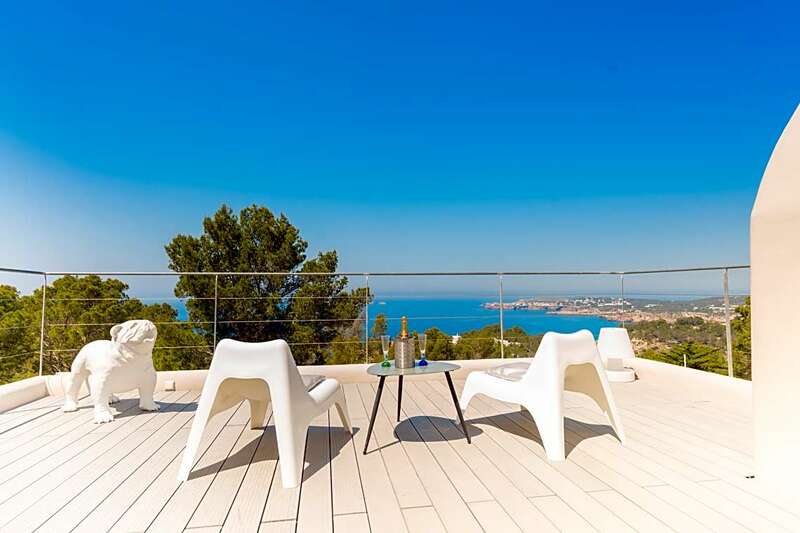 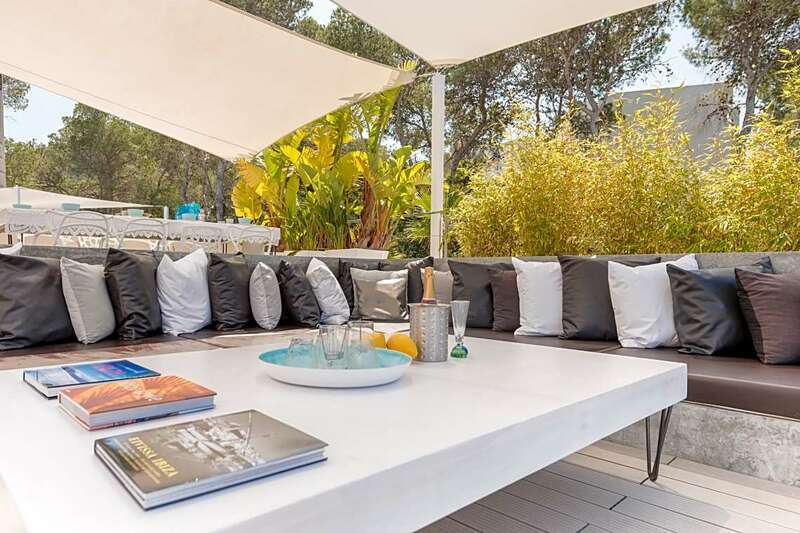 This upper terrace has a spacious chill-out corner with a large sofa from where you can watch the famous Ibiza sunsets. 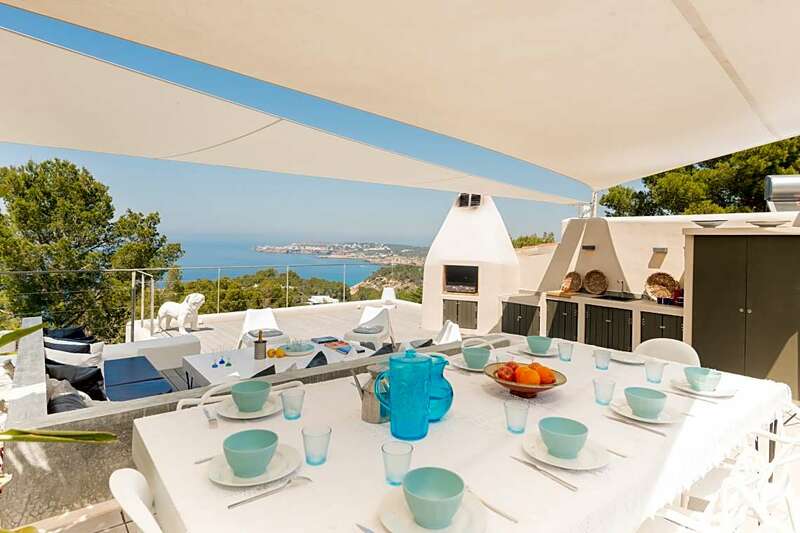 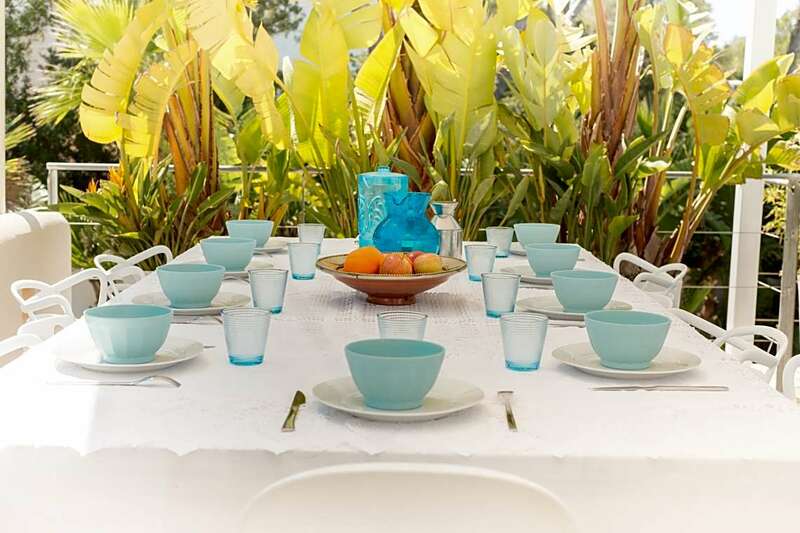 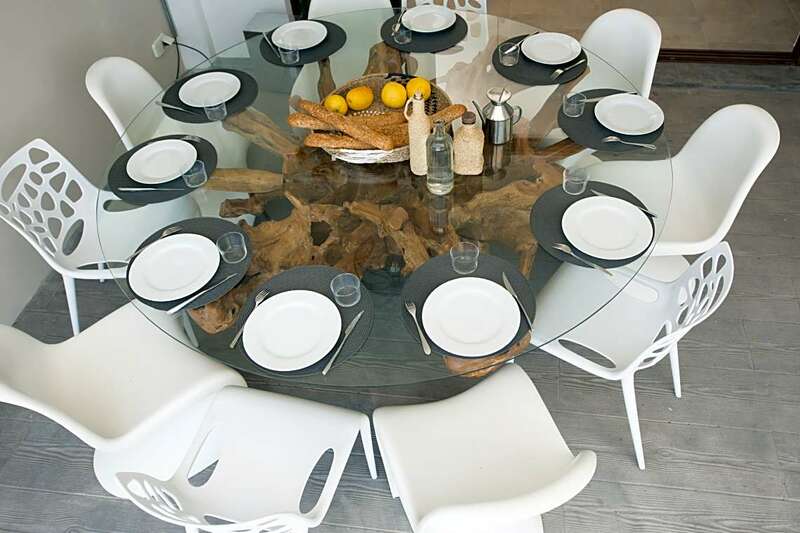 This terrace with solarium has a fully equipped kitchen (plancha, fridge, dishwasher) and a table for 10 people. 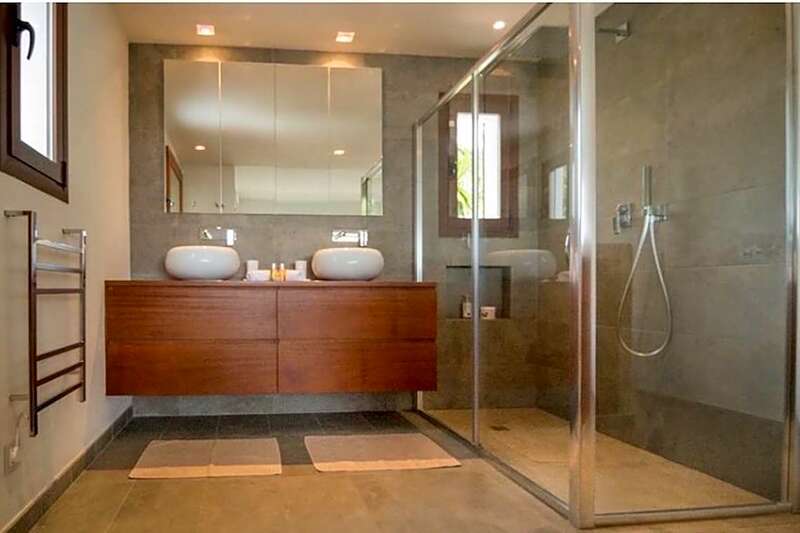 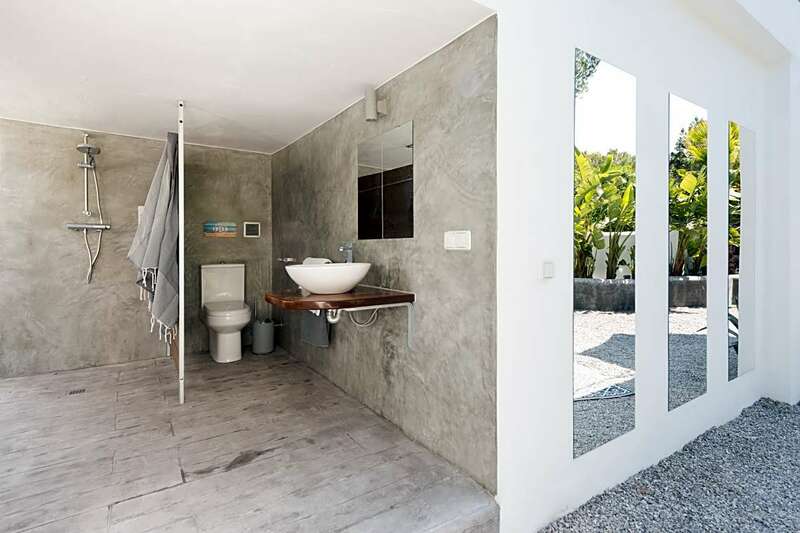 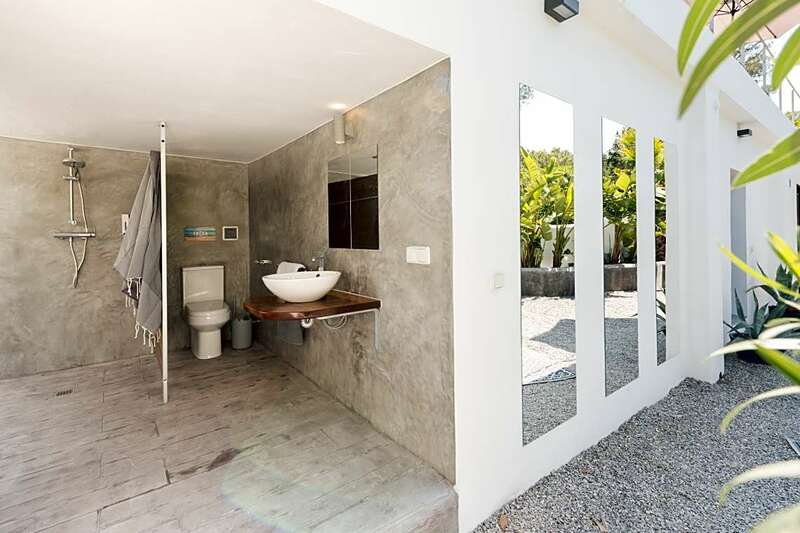 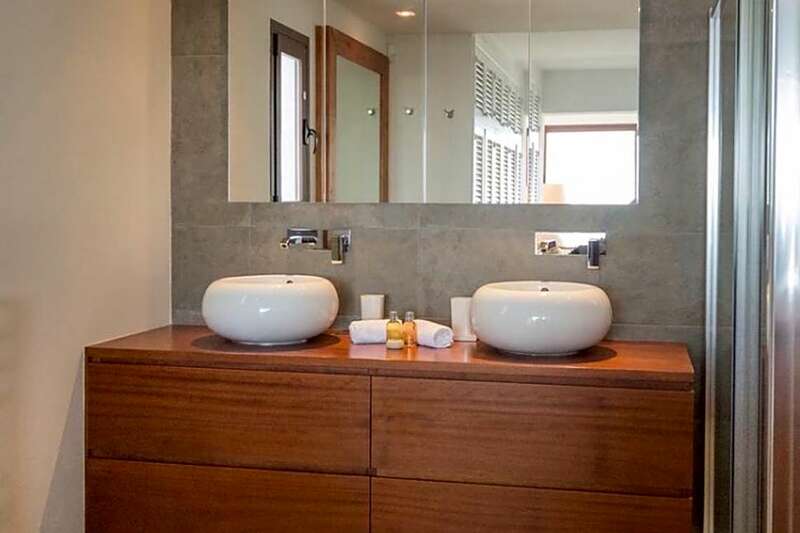 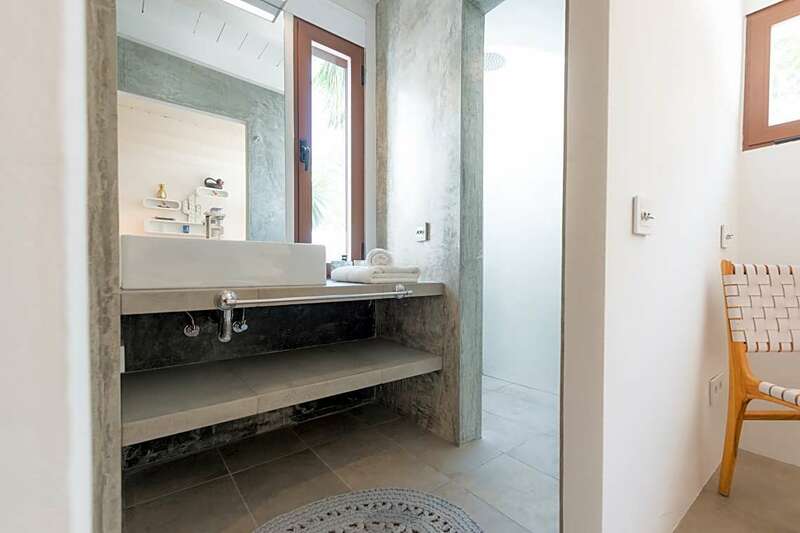 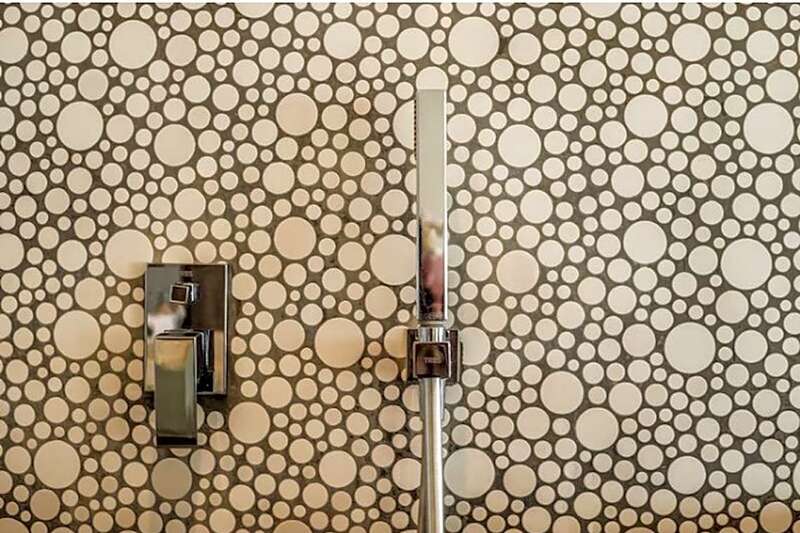 There is an exterior bathroom, 1 exterior shower and the beautiful gardens are illuminated at night. 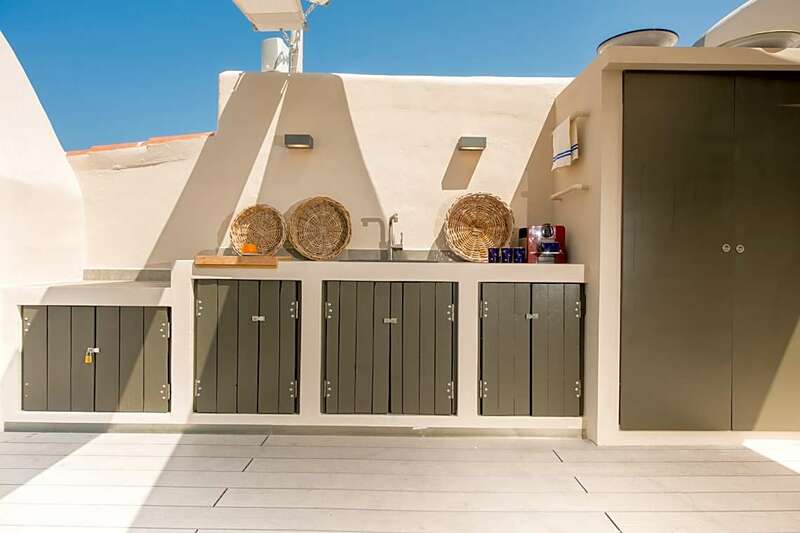 Inside there is a brand new kitchen which is fully equipped with all modern appliances, the tap water is drinkable only from the kitchen (the water is filtrated) and hot water comes from the solar panel system on the roof. 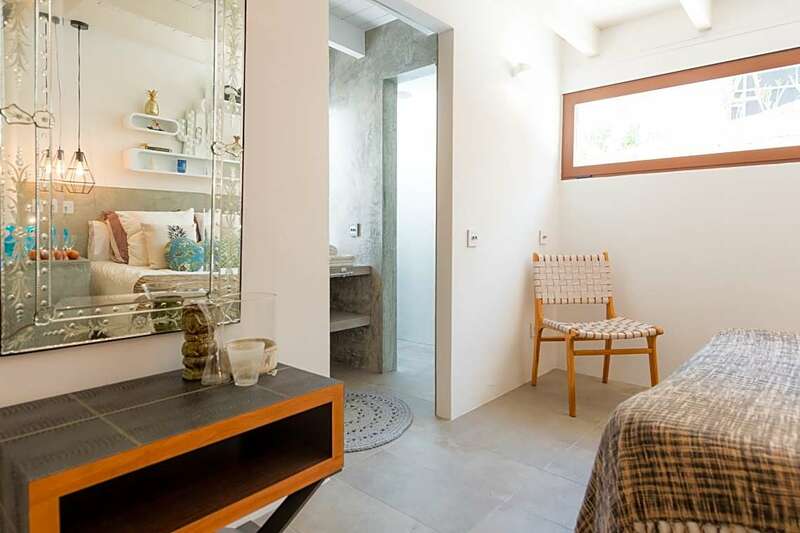 There is an independent laundry with washing machine and tumble dryer. 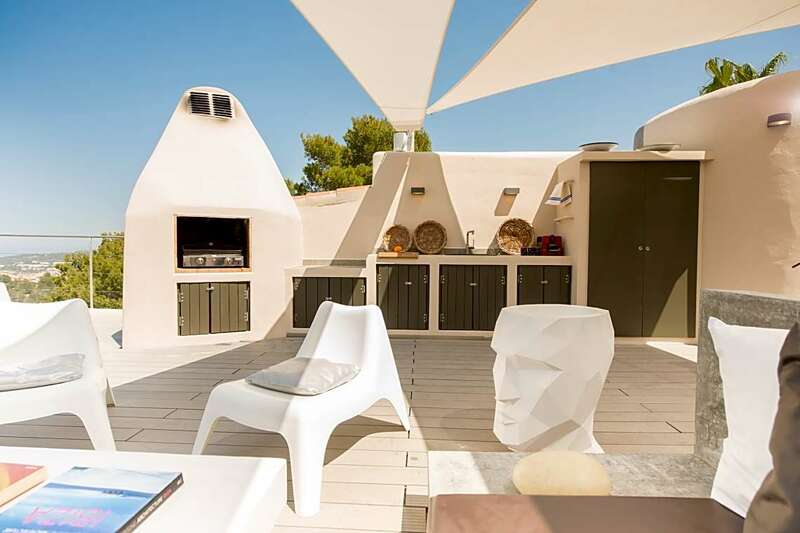 Attached to the kitchen there is a spacious, bright lounge area with doors to the terrace and pool, there are 3 TVs equipped with satellite TV, WiFi internet throughout the house and an iPod docking music system. 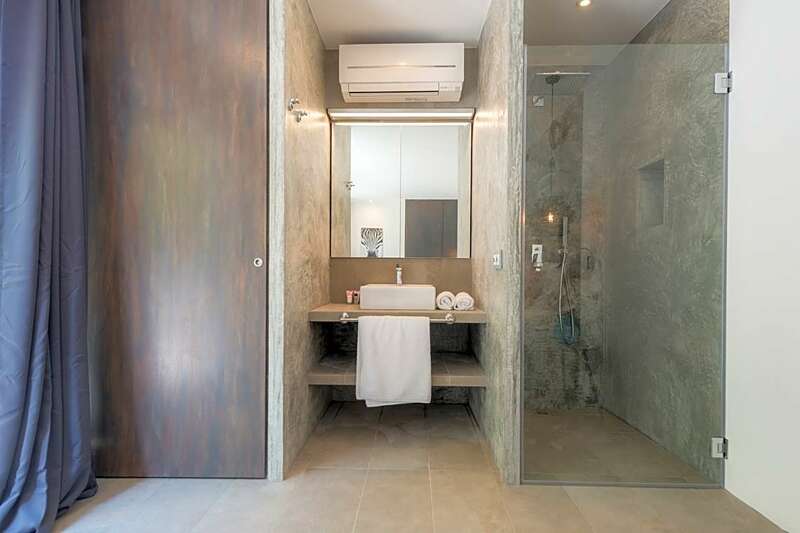 Air conditioning is available in all of the rooms and there are 4 safe boxes. 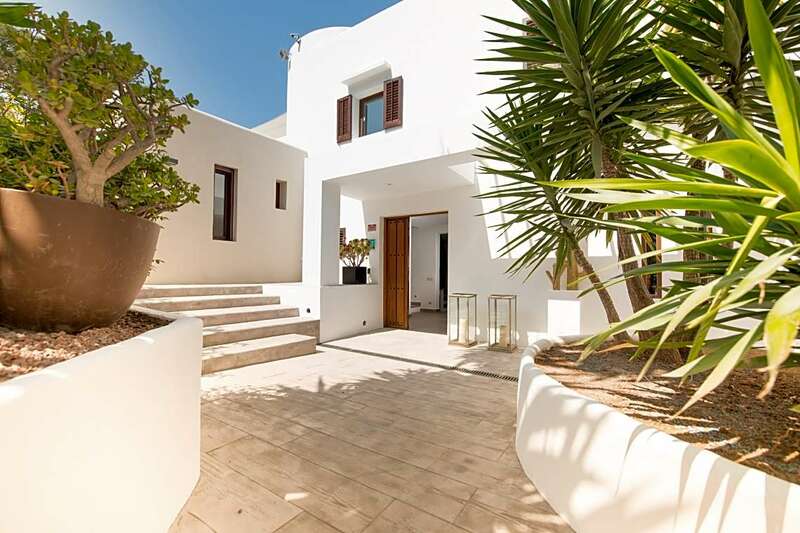 The whole property is protected with an internal and external alarm system. 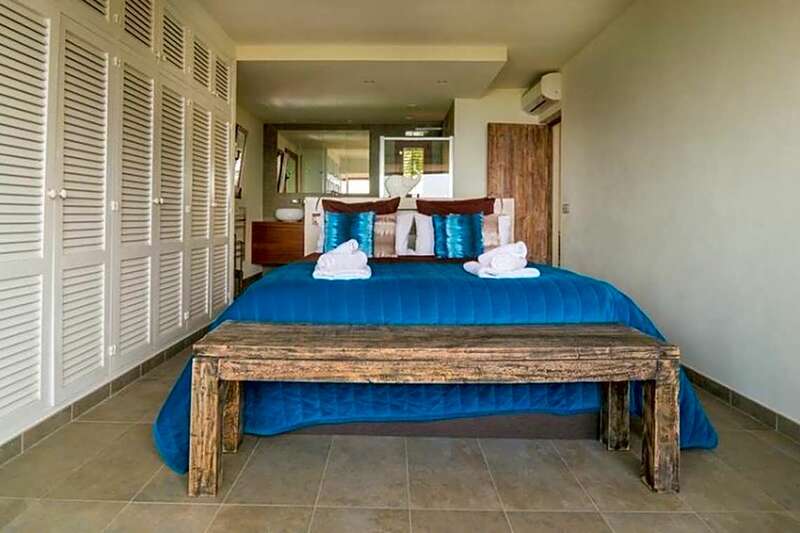 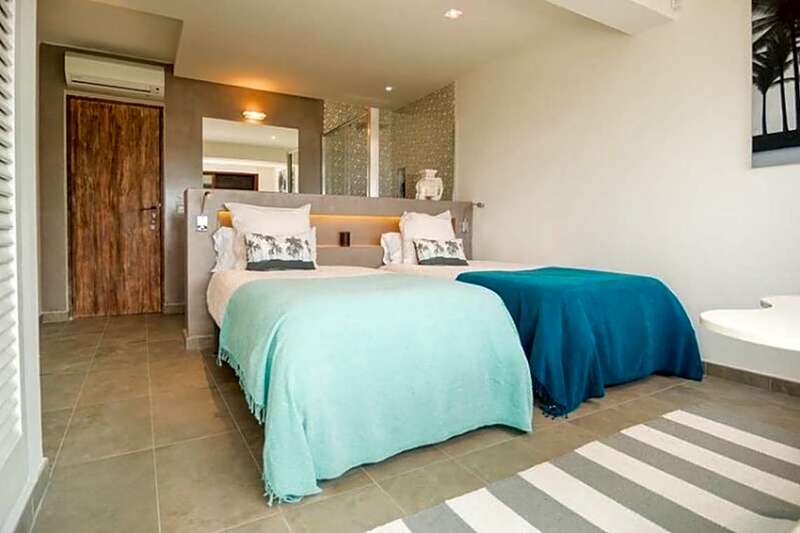 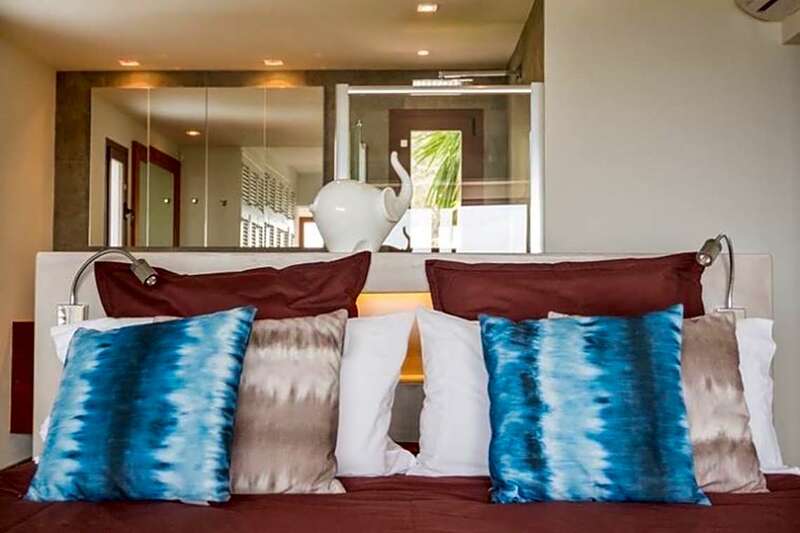 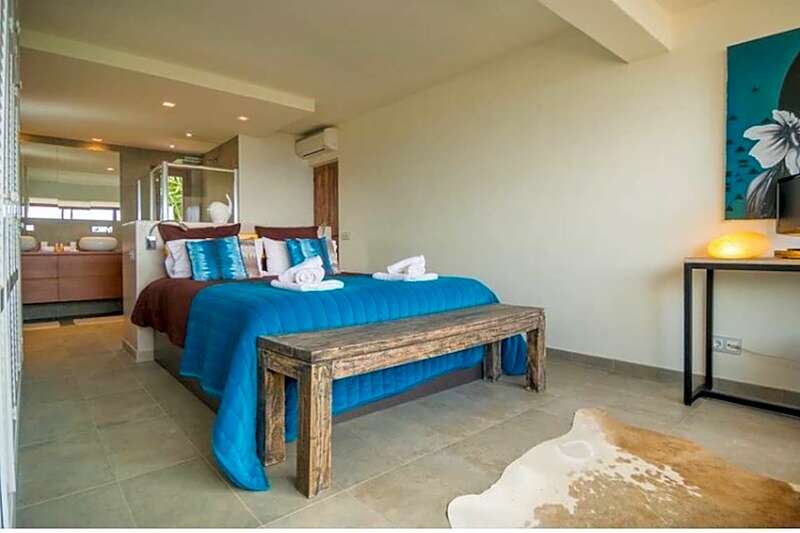 Bedroom 1 Double bed (160 cm x 200 cm), en-suite bathroom, beautiful sea views, air conditioning. 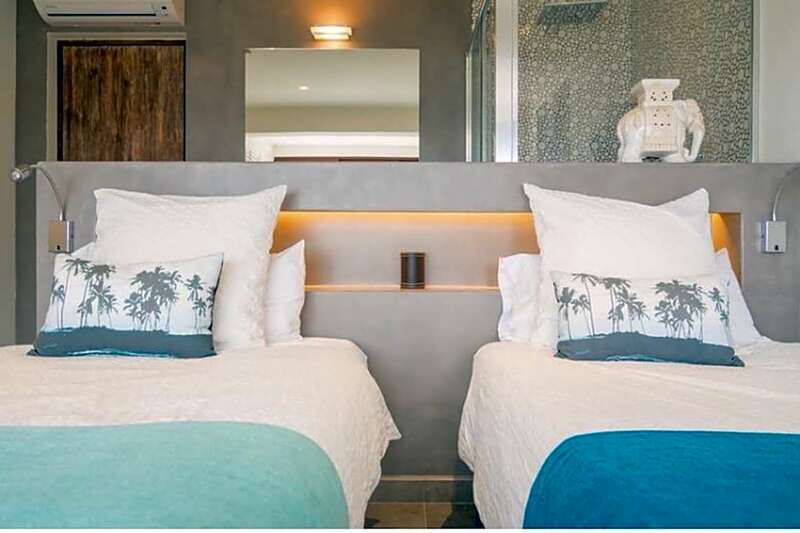 Bedroom 2 2 single beds (90 cm x 200 cm) (can be transformed into 180 cm x 200 cm if client prefers), en-suite bathroom, beautiful sea views, air conditioning. 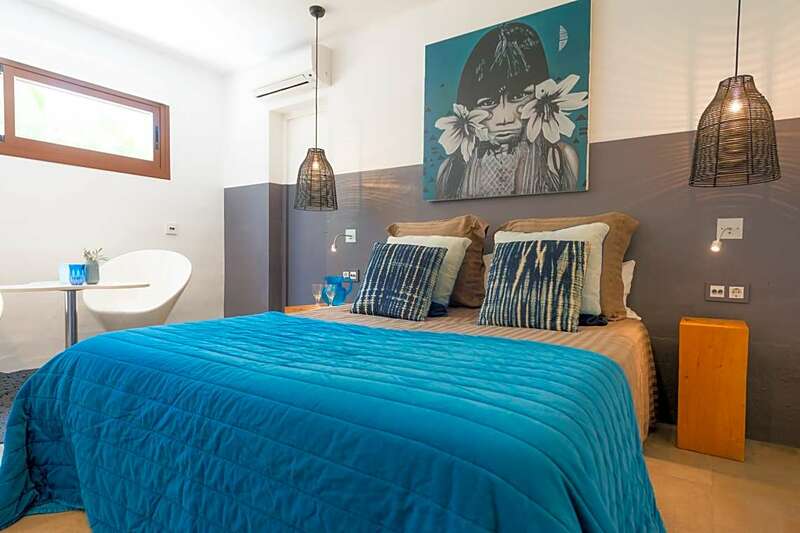 Bedroom 3 Double bed (160 cm x 200cm), en-suite bathroom, air conditioning. 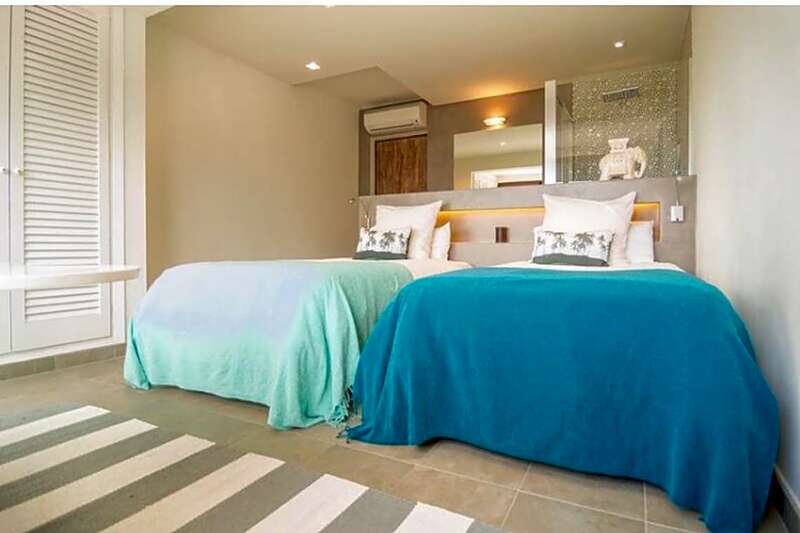 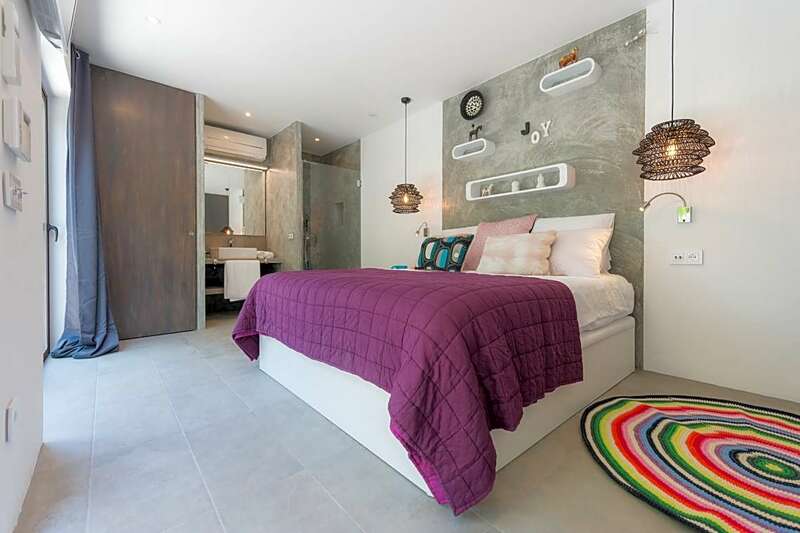 Bedroom 4 Double bed (160 cm x 200cm), en-suite bathroom, air conditioning. 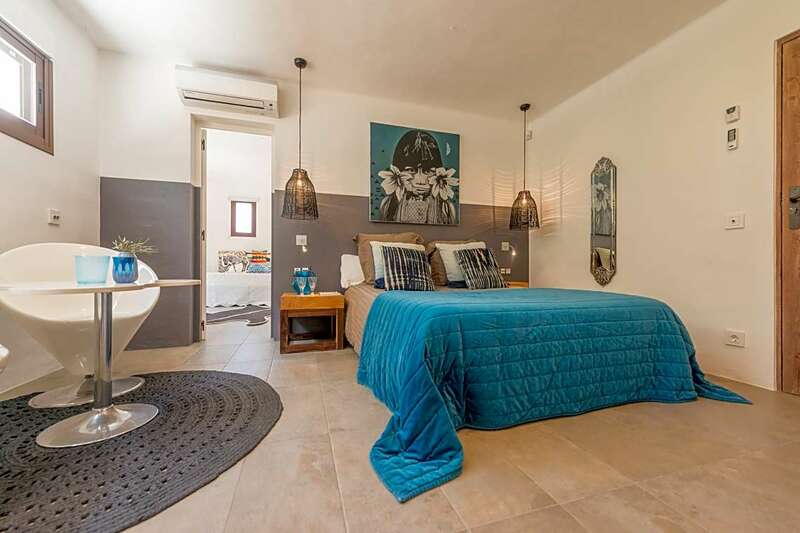 Bedroom 5 Indep Independent bedroom with double bed (180 cm x 200cm), en-suite bathroom, air conditioning, only accessible from outside with its own terrace.